Describe the challenges of maintaining relationships with existing customers. Explain how Einstein Account Insights makes your sales team smarter when maintaining accounts. You’ve successfully convinced VP of Sales Ava Cado and the rest of Honeydew’s leadership that AI can help increase productivity and bolster sales. Sales Cloud Einstein has made you look like a genius. Armed with all that data, Einstein Lead Scoring has helped the team build the pipeline, while Einstein Opportunity Scoring and Einstein Opportunity Insights have helped the team close deals at a record pace. Time to celebrate? Sure. But don’t let success get to your head. We all know that after a new deal is closed, that’s not the end, it’s merely the beginning. Think of your customer base as a garden. It takes a lot of work to get your garden started. You throw in a lot of seeds (leads), and spend a lot of effort nurturing the strongest seedlings so they can grow into strong, healthy plants (opportunities). And thanks to your commitment and hard work, those plants turn into delicious things to eat (accounts). (This is only a metaphor. Please don’t eat your customers.) You celebrate that first harvest with the fruits and vegetables of your labor—literally. But you don’t rip out this garden and start again from scratch next season. Of course not. That would be a huge waste of the time and resources you already spent. Plus, with the right care, many of your plants will produce again next season. But to get the biggest bounty from your garden, you have to tend to it. (Okay, metaphor over.) The point is, if you want your customers to come back, you need to devote time and attention to them, even anticipate their needs. The more customers you have, the better chance you have for repeat business. Honeydew has been growing fast, which means more customers. And with so many new accounts—and no additional sales reps—the team has had a hard time making each customer feel special. Too much information gets diluted and important nuggets get lost within the multitude of conversations. Einstein Activity Capture has definitely helped keep emails and events logged on the relevant records. But even when reps do manage to keep up with what customers are telling them through direct communication, what about all the things customers aren’t telling reps? Just yesterday, Tom Ato, the Relationship Manager at Honeydew, was reading the newspaper on the train home from work. On the back page of the business section, he read that one of his accounts, Food & Stuff, was in talks to acquire a competitor, Meals & Things. This morning, Tom storms into your office, fuming about how he needs to call his contact at Food & Stuff and try to get a new deal to incorporate their expanded business. How can he stay up to date about all his customers? You reassure him you’ve already taken care of it. You and Sales Cloud Einstein have another trick up your sleeve—Account Insights. Einstein Account Insights helps your sales team maintain their relationships with customers by keeping the team informed about key business developments that affect customers. Knowing what's impacting your customers' companies gives your sales team an edge when deciding whether customers are open to sales and how to proceed. Is the company expanding? Changing executive leadership? Acquiring competitors? Einstein Account Insights provides news articles from reputable sources that give your sales team the complete picture. So now, instead of combing the business sections of various newspapers, all Tom needs to do each morning is log in to Salesforce and look at the Einstein Insights component on his Home page. There, he sees insights about the accounts he owns and the accounts his account team owns. He clicks on an insight that says Food & Stuff has been mentioned in merger and acquisition talks and sees several news articles, including the one he read on the train. Tom makes a note to send you some flowers, then picks up the phone to make the call. Einstein Account Insights also includes newsworthy developments about company expansion. From the Home page, the team can email these insights to others or share them with other users and groups through Chatter—that way, everyone stays up to date. Reps can dismiss insights they don’t want to see or leave feedback about the relevance of individual insights. Einstein Account Insights are also on account detail pages, so the information stays handy when you’re focused on specific accounts. 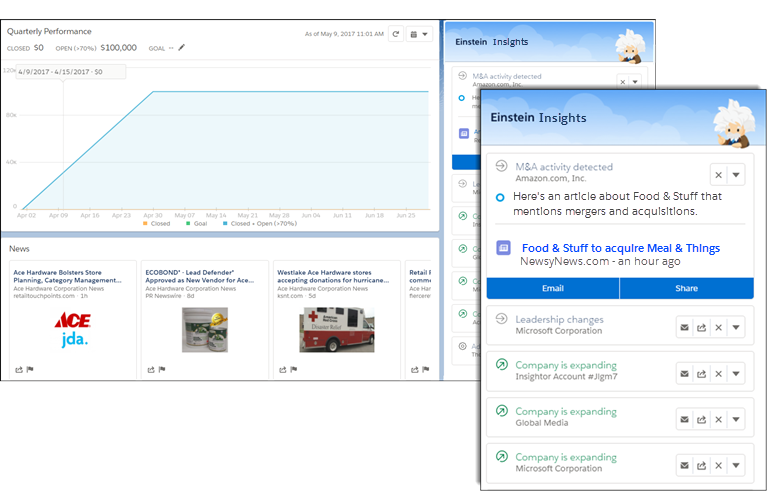 And, if you use Einstein Activity Capture, activity-related insights (such as when a contact mentions a competitor or is leaving their company) are identified from recent emails and events related to accounts. With a complete picture about a customer’s business environment, your sales team can make better choices about how to approach each customer. They’ll be well on their way to creating strong, long-lasting relationships. So now you’ve seen how Einstein can help you stay on top of changes to your most important accounts. This is all well and good, but what about additional AI tools for sales managers? Well, as it happens, Einstein has a final course to offer.